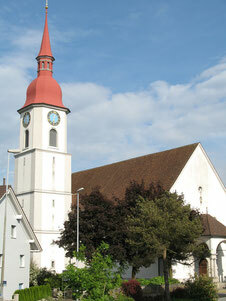 Auw is the birthplace of Saint Maria Bernarda Bütler. 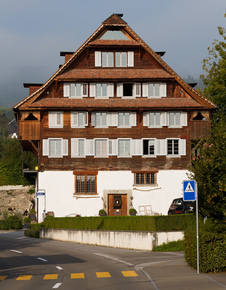 Auw is a village of about 2'000 inhabitants in central Switzerland. 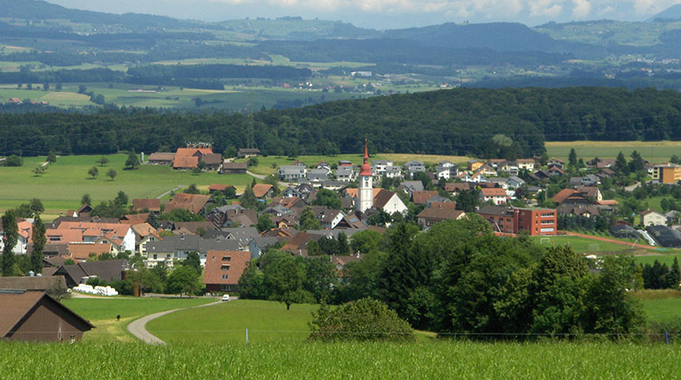 Auw is located in the canton of Argovia (Aargau) in a region called Freiamt. Click here to show it on the map. The place is about 500 meters above sea-level. The village was first mentioned in 924 AD. The name "Auw" means "land by the water" because before the agriculture was intensified, there were many little brooks in Auw. Some streams still flow throug the commune and the river Reuss is nearby. The emblem of the community shows a green lime tree on white Ground. The Church of Saint Nicolas was built in 1705. Before there has been a Chapel in the same place. The Chapel of Saint Joseph in Rüstenschwil has a beautiful ceiling painting from Joseph Keller. In the centre of the village there are some careful restored houses - some of them were built in the 15th century. The so called "Rüssegger Muur" in the forests is the remainig part of a wall of loose megalithic stones in a line. From Auw you can reach the centre of Lucerne in half an hour and the city of Zurich in 40 minutes. The viewpoint of Horben is just seven kilometers away on the hill of Lindenberg, where you can find really nice trails for a walk or a hike. Click here to show it on the map. Auw is located 489 meters above sea-level in central Switzerland.